I admit, I was enticed by Paradise Dynasty's floor to ceiling advertisement of their 8 International Flavoured Xiao Long Bao (S$14.80++) at Vivo City (proof that marketing does work). It has everything that I love wrapped in tiny parcels that are delightfully colour coded. So...off I went to try ALL flavours (much to the shock of Moon). The Ginseng had that distinct ginseng flavour which is good. The Foie Gras XLB was absolutely delightful as the creamy taste of foie gras exploded into my mouth. When you're riding the high of the foie gras, pop in the Black Truffle XLB and you'll get that perfect harmony. You'll feel sorry that you've got to eat another flavour soon after. Almost. The Cheese XLB had the cheese flavour but after the Foie Gras and Black Truffle, you'll be a little disappointed that the party didn't continue in your mouth. Crab XLB was how it should taste and is quite comparable to the Crab XLB that Din Tai Fung offers although Din Tai Fung wins for reasons that I will explain later. The Garlic XLB was good! I liked how it was garlicky without being overpowering. I was quite apprehensive about that. I was the most curious about the Szechuan XLB. I knew that it was going to be spicy, which is why its recommended that you eat this last. Besides being spicy, I found that it was not simply chilli inside. It was ma la (麻辣) spice - chilli hot and numbing. Good news is that it's not overpowering. Really happy with the last XLB. Now, the only disappointing part of the whole XLB experience was the skin of the XLB. It broke the minute I picked it up and it didn't break at where my chopsticks were but at the bottom, which is the strangest thing. Also, the tips of the XLB were not as moist as it should be. 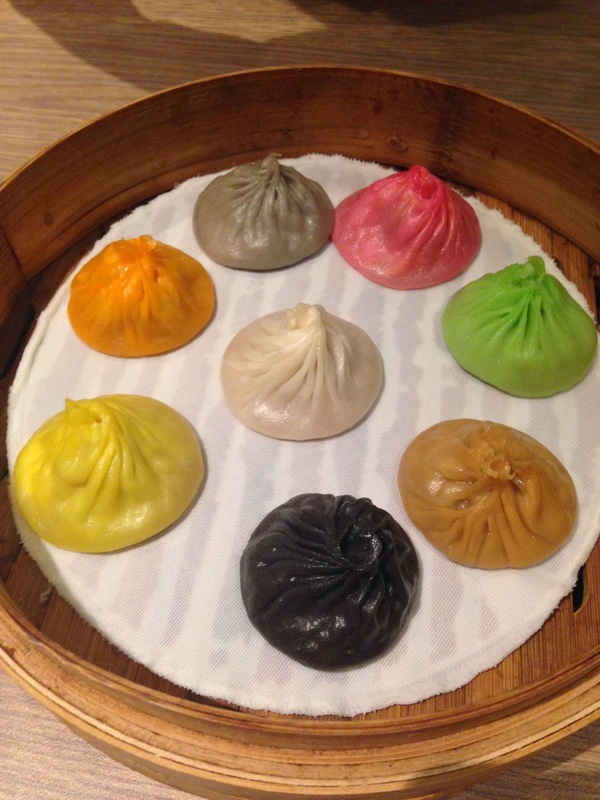 Paradise Dynasty needs to take some lessons from Din Tai Fung on this I have yet to find a restaurant to beat those XLB with 16 distinct folds (yet another well marketed fact by Din Tai Fung). Nonetheless, these 8 charming parcels of pork with yummy flavours are worth every dollar. I'll go to Paradise Dynasty for them anytime over Crystal Jade. Oops. Egg white souffle with red bean and banana (S$5.90++). Delicious!!! I could eat the whole plate by myself. I seriously need to learn how to make these. This is an all-time favourite with me. Light fluffy meringue that is more marshmallow-like in texture is wrapped around red bean paste and banana slices before fried and sprinkled with icing sugar. Love.